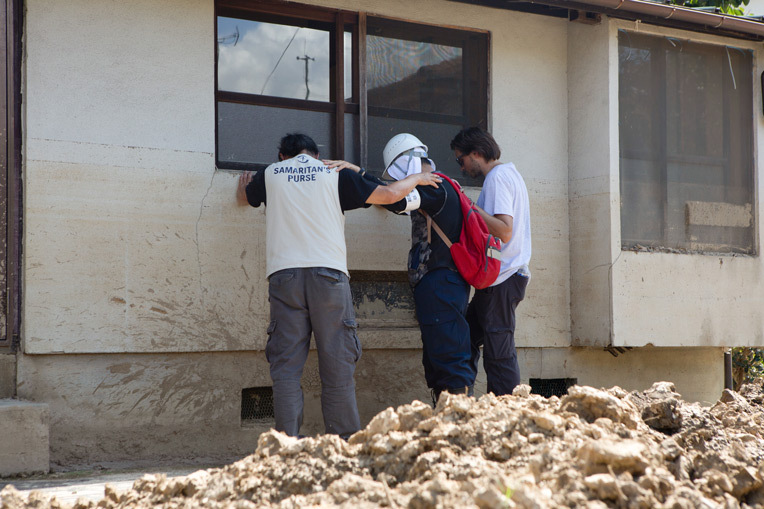 SAMARITAN’S PURSE HELPS MOBILISE AND EQUIP JAPANESE VOLUNTEERS TO ASSIST THEIR FLOODED NEIGHBOURS. Feeling a burden for the homeowner and his wife, the pastor didn’t give up. He persevered and prayed for God’s guidance. The Lord led him to the Christ Church Kure Volunteer Centre, where he met Chris Kuriyama, a member of the disaster assistance response team that Samaritan’s Purse deployed to Japan after record-setting rainfall in July resulted in massive flooding and landslides. Samaritan’s Purse is coming alongside local churches in Japan to mobilie and coordinate volunteers who are sharing the love of Jesus Christ while helping people clean up and move back home. We are also providing equipment, tools and other materials to the disaster relief networks—like the one in Kure—so that volunteers can complete clean-up projects. 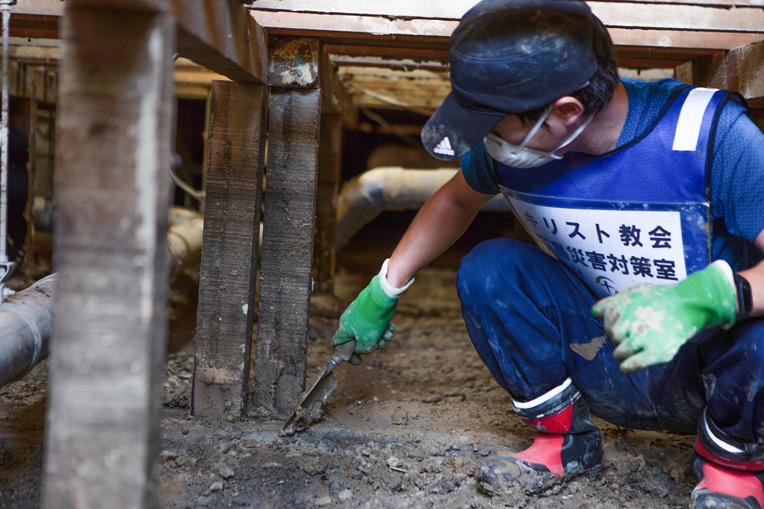 Volunteers are helping clear mud from floor beams in a flood-stricken town in Southern Japan. The pastor and Chris talked about this couple and set a date for volunteers to help them. A team of 15 people traveled over 200 miles from Osaka to help, showed up at the appointed time and prayed before they started working. As the volunteers served, they sang praise songs and this touched the wife’s heart. She loves gospel music—like so many people in Japan do. Even though she is not a Christian, she recently started attending a church in Kure just to sing gospel songs. Not only was the wife affected by the work and music, so was her husband. His attitude toward Christians softened and he appreciated all that they were doing for them. About 400 Japanese volunteers have responded to this disaster and completed nearly 50 work orders in the Hiroshima and Okayama Prefectures, with many more jobs in progress. These include not only cleaning out houses but also removing debris from streets, parking lots, gardens, yards and drainage ditches. They’re also tackling the cleanup of the Children’s Center in Okayama—a significant job. Shortly after that triple disaster, Samaritan’s Purse sent 93 tons of relief supplies to Japan for displaced victims. Later, as bases were established, we hosted more than 7,500 volunteers who provided over 185,000 hours of work. A total of 460 clean outs were completed and 509 homes were reconstructed. In addition, we provided various types of infrastructure support, including construction, reconstruction and long-term rental assistance. Until that point, interdenominational church networks did not exist in Tohoku in the same way they do now. (Tohoku is the six-prefecture region of northeastern Japan intensely affected by the tsunami.)  The growth of these networks can be attributed in a significant way to Samaritan’s Purse, which became a unifying and catalysing agent among the region’s Christian community.